In Mobile World Congress last week, Google and several global operators announced the launch of a mobile industry initiative to accelerate the availability of Rich Communications Services (RCS) in Android. Operators have agreed to transition toward a common, universal profile based on the GSMA's RCS specifications and an Android RCS client provided by Google in collaboration with operators and OEMs. Also, GSMA RCS advanced calling features will be supported in the future by Google. The support for VoLTE RCS requires seamless authentication in operator networks. This can be implemented with Radiator GBA/BSF Support Module. Radiator GBA/BSF Support Module works as an authentication proxy between the end-user UE and HSS. It authenticates the user requests, and separates the authentication procedure and the Application Specific server (AS) functions to different logical entities – for example, call forwarding and other Rich Communication Services. We have already deployed Radiator GBA/BSF Support module to real operator networks in order to provide support for seamless VoLTE RCS authentication. In case you are interested in our solution, please contact our team at support info@open.com.au. When talking about Network Function Virtualization, it is important to differentiate between true NFV solutions and traditional server-virtualisation techniques, where someone has to care for each virtualised server and their configurations. If the NFV concept is limited to managing a farm of virtual servers manually, many benefits of NFV are missed. In a true NFV, such as any of the Radiator VNF solutions, VNF manager does the scaling and configuration of virtual servers automatically. 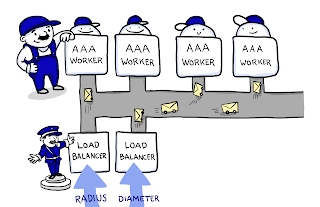 For example, in our vAAA solution the VNF manager monitors the RADIUS and Diameter traffic distributed by load balancers and launches new AAA workers automatically to meet the workload. In addition to launching new workers, all the new instances in the cloud are configured automatically by using the centralised configuration management service. Configuration management uses metadata services to automatically create configuration for the current cloud setup. External connection parameters can be pre-configured and/or configured via NETCONF by OSS/BSS. This kind of scaling is needed, for example, when all end user devices authenticate to the network at the same time. This may happen during rush hours, major public events or when things like sudden power failures happen. 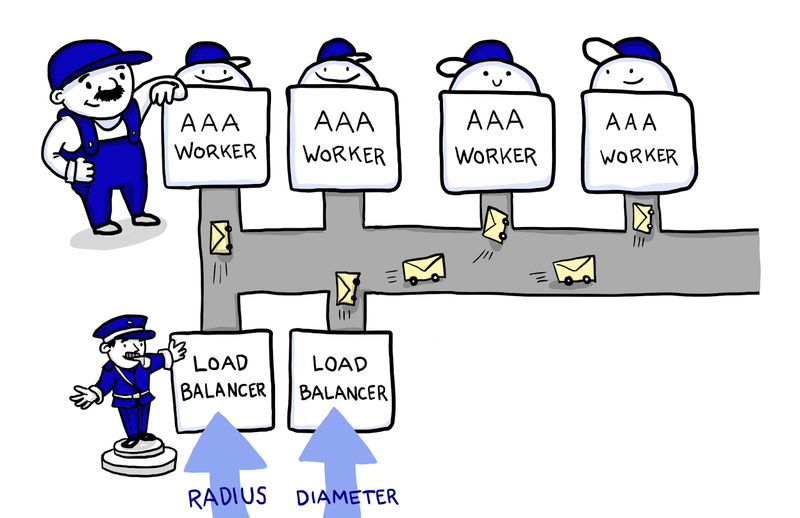 When the new AAA workers are not needed, the NFV manager shuts them down automatically – without any manual action or configuration. As telcos, service providers and enterprises are now looking for solutions using network function virtualisation (NFV), we here in OSC provide a solution for this. We are happy to announce Radiator is now available as the first true implementation of the AAA virtualised network function – Radiator VNF. Our customers have always said that Radiator is a Swiss army knife of AAA servers and we want to ensure it will be interoperable in the future as well. Because of this, Radiator VNF is developed and tested together with leading operators, integrators and vendors – and it works with any industry standard NFV infrastructure. To get most out of scalability, the key benefit of NFV technology, Radiator VNF is equipped with additional components such as RADIUS and Diameter load balancers as well as separate AAA and database workers. This ensures that it automatically scales in and out according to actual transaction needs. In addition to this, scaling in Radiator VNF is controlled by its management and monitoring components. Management and monitoring components together with Radiator VNF Manager ensure that instead of having too many dedicated authentication servers only waiting, you automatically have the right number of server instances at all times. For integration needs, Radiator VNF includes a redundant message queue for inter-component communication. All Radiator VNF components utilise this message queue for communication, and provide clean, clear interfaces to make future service integration easy and flexible. We are happy to make Radiator VNF a part of your NFV solution. Radiator VNF is delivered as a VNF image which is ready to be deployed quickly and easily across infrastructures. For more info, please visit our website and contact our team at info@open.com.au.